Dealing Rationally With Feeling Upset. Many people wrongly believe that other people or situations make them upset. The reality is that it is not your situation, but your thinking about the situation that primarily makes you feel the way you do. If situations really caused feelings then everyone would have the same feelings about the same situations, but different people often react very differently to the same situation. For example if two different people are called an unpleasant name, one of them might feel sad while the other might feel angry. The real trick to maintaining emotional stability is figuring-out which thoughts get you upset, and then dealing with those thoughts effectively. Fortunately, Rational Emotive Behavior Therapy makes this as simple as A-B-C-D-E! So, what goes into each box? “A” is the “activating event,” in other words the situation over which you are making yourself upset. You can put that situation as well as most of your thoughts about it in the first column. As in our example, let’s say someone calls you a name. “B” stands for “beliefs.” There are some very specific thoughts that cause a person to become upset. These are called irrational beliefs because, although they might seem like it at the time, they are not very realistic. There are four basic irrational beliefs. The first is to demand that something has to go the way you want it to go. People often use such words as “should,” “should not,” or “ought to” when holding this belief. Anytime you use the word “must,” or can use it in place of those words, you are likely insisting that something has to go your way. The other thoughts that cause trouble include believing that it is horrible when things do not go the way you insist they must, the belief that you cannot stand it when such things happen and finally blaming either another person, yourself or the world because things did not happen the way you insist they should have. All four of these beliefs will not apply to every situation, but they can. “C” is the “consequence” of your thinking, which will be a feeling. In this situation let’s say you react with anger. Of course different thoughts about the same situation would lead a person to feel other ways, depressed for example, but it is the thinking that primarily determines this response. “D,” or disputing, is asking yourself some questions about your beliefs to determine if they are realistic. For example, is it realistic that just because you want something to go a particular way that it truly has to go your way? Where is it written that things “have” to go the way you want them to go? What is the effect of holding on to this belief? Is it “really” true that it is awful (as bad as something can possibly be) when things don’t go your way? As bad as it is didn’t you stand it, proving that you can? Are you, the other person or the world “totally” bad for doing what you/she/it did or are there are also some redeeming qualities? “E” represents “effective new thinking,” in other words looking at the situation in a new way. This should be very realistic. After all, how could you feel any different about the situation if there remained any doubt that you are being honest with yourself in looking at it differently? The reality is that nothing has to go the way you want it to go. You certainly have your preferences, but it is not the worst thing in the world when they are not fulfilled. You have no doubt withstood multiple situations in which things did not go the way you desired and it hasn’t killed you yet and, in all likelihood, you will withstand this situation as well. Whoever (including yourself) did not live-up to your expectations is not a totally bad person; but is rather someone who, while fallible, has some good qualities as well. The way this works in real life is once you realize you are upset, get away from the situation to the extent necessary to allow yourself the opportunity to calm down enough to think about what just happened. It is best to put it on paper in order to keep everything clear. Using our example above, you would start by identifying the A, B and C as outlined below. It is often easiest to begin with the C (feeling) column, and then do the A column before moving on to do the B column. 2. It is horrible to be disrespected. 4. This person is a *#! @ (really bad person) for treating me that way. Once you have outlined the situation, it is time to begin questioning your beliefs and thinking about more rational ways to think about the situation. 1. People must respect me A. Does anyone really HAVE to respect me? B. Where is there any evidence that people MUST respect me? C. What is the effect of holding this irrational belief? 1. Just because I want them to, there is no reason that anyone really HAS TO respect me. 2. It is horrible to be disrespected. A. How bad is this situation on a scale from 0-100? B. What situation would be worse than this (e.g. being tortured)? C. What would make this situation even worse? D. Re-evaluate, really how bad is being disrespected? 2. I don’t like this situation a bit, but there are things that are certainly much worse. 3. I cannot stand it when I am treated that way. A. Isn’t it true that I really CAN stand it? (Especially since I already did)! B. Would I be willing to stand an even worse situation for $ 1-million? 3. As much as I don’t like being disrespected, I only make myself more upset by saying that I cannot stand it — because I really can! 4. This person is a *#! @ for treating me that way. A. Who is perfect? B. What sense does it make to expect this person to act just as I want them to? 4. This person is not totally bad. In fact, this person (like everyone else) is a fallible human being who also has some good traits (you will find some if you look for them). Imagine what it would feel like to go from saying the thoughts listed in column B to saying the thoughts listed in column E. Really, stop for a moment, and try it. Then ask yourself if there is anything in column E that is not true. You will find that you are actually thinking more rationally to hold the thoughts listed in the E column and, because that will improve the way you feel, it will certainly give you the ability to better handle whatever the A is much more effectively. While it is possible that there can be more than one “must” over which you can be upset in the same situation, this same process can be used with each of them. Listing your thoughts on paper as demonstrated above can help keep them all straight. While you will also have thoughts that do not fit into the B column (they can go in the A column) it is most important to deal with the beliefs that are listed in the B column first. You can use many of the same disputing questions on those in the A column if you still feel a need to do so after you get done disputing those in the B column. It is important to know that we have thinking habits as surely as we have habits of behavior. It will take work to overcome the old conditioned thinking habits like the ones you have listed in the B column. If you continue examining your old irrational beliefs and applying your new beliefs in real world situations you will get to the point where the new thinking and the improved ways of feeling becomes automatic for you. ~ Contributed by Richard Applegate. 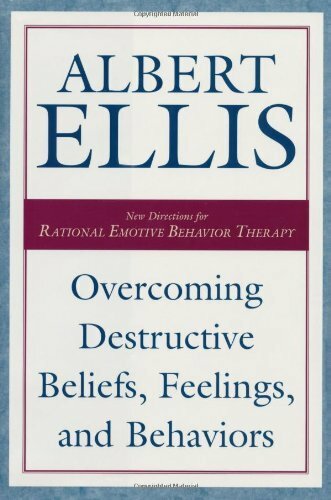 Richard holds a master’s degree in Clinical Psychology and is certified as a supervisor in Rational Emotive Behavior Therapy, the principles on which this article is based, by the Albert Ellis Institute.